The 74ALVC16835A is a 18Ã¢â¬âbit registered driver. Data flow is controlled by active low output enable (OE), active low latch enable (LE) and clock inputs (CP). When LE is LOW, the A to Y data flow is transparent. When LE is HIGH and CP is held at LOW or HIGH, the data is latched; on the LOW to HIGH transient of CP the A-data is stored in the latch/flip-flop. â Complies with JEDEC standard no. 8-1A. 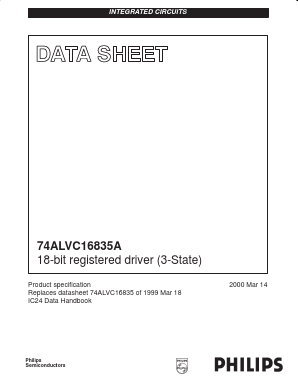 74ALVC16835 18-bit registered driver; 3-state View NXP Semiconductors. 74ALVC16834A 18-bit registered driver with inverted register enable; 3-state View NXP Semiconductors. 74ALVC162834A 18-bit registered driver with inverted register enable and 30 â¦ termination resistors; 3-state View NXP Semiconductors. 74AVC16835A 18-bit registered driver with Dynamic Controlled OutputsÃ¢âÂ¢ (3-State) View NXP Semiconductors. 74ALVC16836A 20-bit registered driver with inverted register enable (3-State) View NXP Semiconductors. 74ALVCH16825 18-bit buffer/driver; 3-state View NXP Semiconductors.